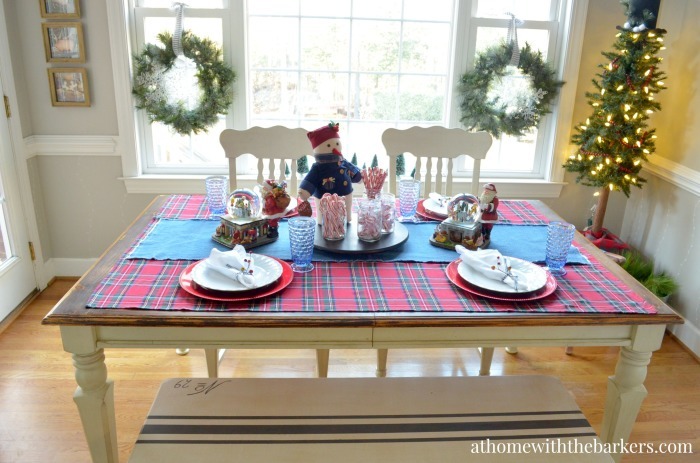 I put together a fun, colorful and simple Christmas Table Setting for our family. 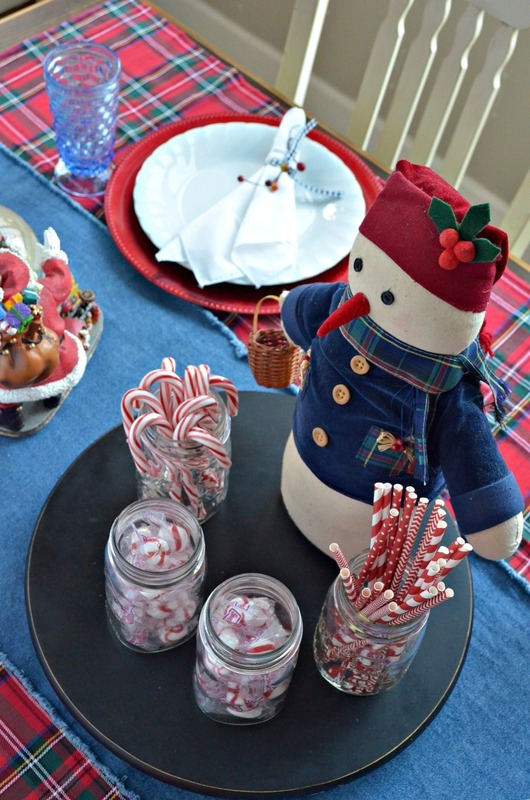 We have a tradition in our home that includes breakfast casserole and homemade hot chocolate on Christmas morning so I thought we needed a fun table setting to go along with it. I didn’t pull out the cute Christmas mugs yet but I will. I decided for our kitchen table to use some things we love. I went with a COLORFUL snowy theme and used my snowman, snowflakes and snow globes. 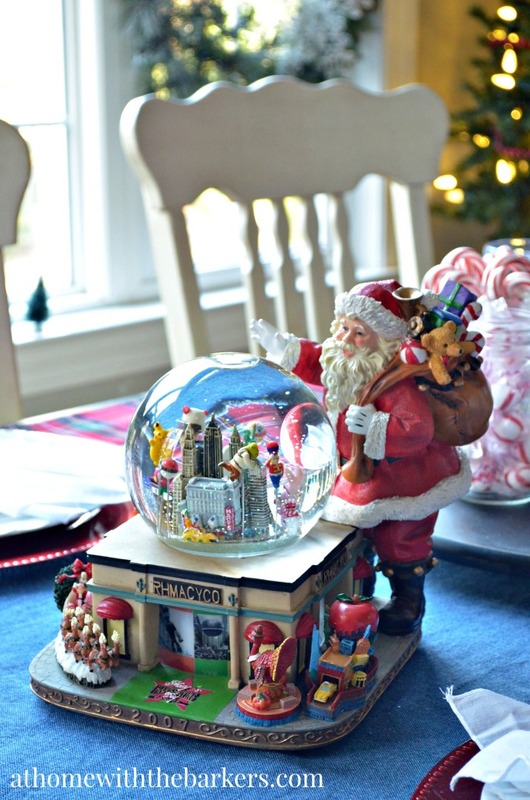 I have many of these Macy’s Parade Snow Globes and I absolutely LOVE them. I have collected them over the years and my husband gave many of them to me as birthday gifts. My very favorite one is from 2001. As you all know the Macy’s Thanksgiving Parade is in NYC so much of the skyline is always in the globes. This particular one still has the twin towers in it because it was created months before the terrible terrorist attack on September 11. For my table setting I used two beautiful one’s with Santa on them…since Santa is a BIG deal in the parade, I thought it was appropriate. The snow globes also represent all of things my kids loved each year as they were growing up. Pokemon, Clifford the Big Red Dog, Scooby Doo, Dragon Tales, Jimmy Neutron, and SO much more. 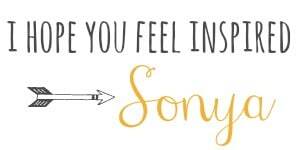 It’s nostalgic for me and I love it. I also think my teens love it too! 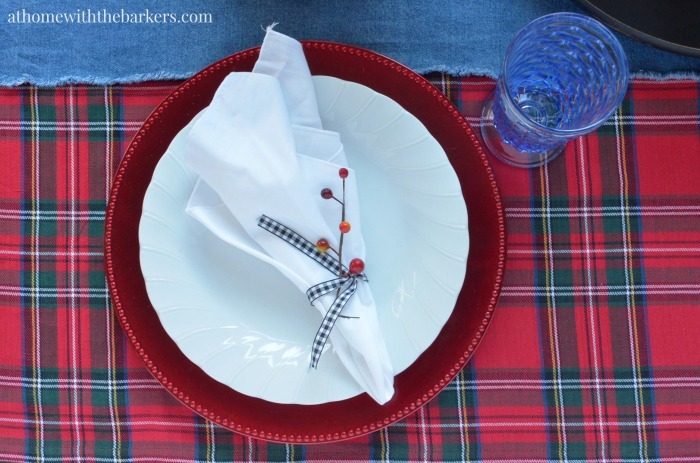 To keep the traditional fun going I used what remained of my plaid table cloth that I cut up for other projects! Then I added the denim table runner I made back in the fall. This really is a thrifty table setting! The red chargers were $1 each from Big Lots, years ago, the white plates are from a yard sale and the Lazy Susan is a piece I painted from Ikea. 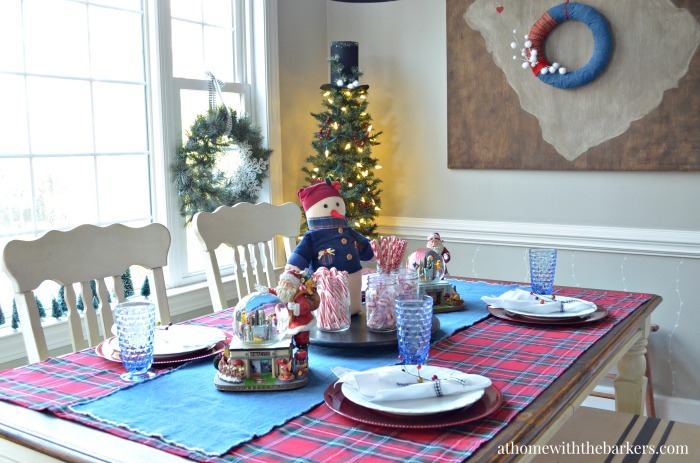 Don’t think your table setting needs to be magazine worthy to please you and your family. Make it beautiful with items you have at home and that you already love. I love the old fashioned Christmas feel Getting back to the basics. Great job. I’ll be right over for that hot chocolate. Merry Christmas.